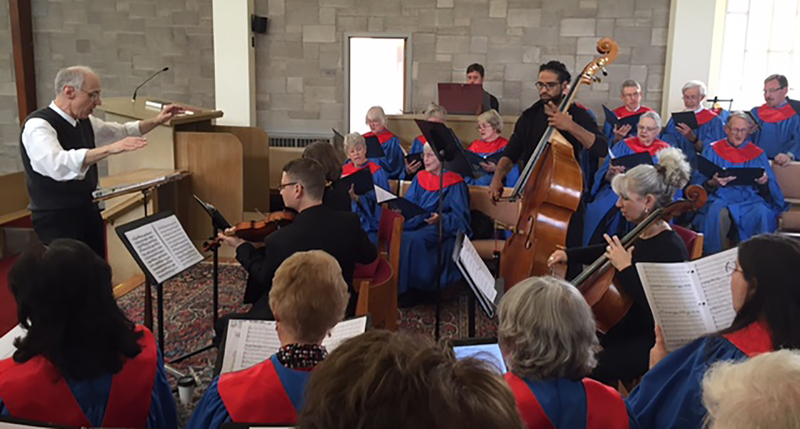 Music is an integral part of our worship services. It has the ability to inspire, deepen our spirituality, and help connect us with one another. We invite you to learn about our many musical offerings and ways in which you can participate. Our Senior Choir numbers about 30 members. We welcome all who love to sing. We rehearse on Thursday evenings from 7:15 to 8:45, and we sing every Sunday. Please drop in any time, and contact Bill Cowdery for more information: wwc147@gmail.com. 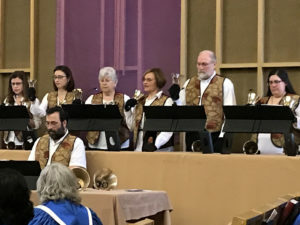 Our Senior Handbell Choir has about twelve members, and we invite new ringers warmly! We rehearse on Thursday evenings from 6:00 to 7:00, and we play on Sundays about once a month. You are welcome to contact Bill about ringing with us: wwc147@gmail.com. 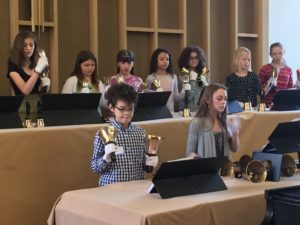 Nancy Weislogel leads our Junior Handbell Choir, with about fifteen members. We practice almost every Sunday after service, and we play five or six times a year, including Christmas Eve and Celebration Sunday. We would love to have you join us! Please contact Nancy at ncs1@cornell.edu. Our Junior Choir sings five or six times a year, including Christmas Eve and CelebrationSunday. We practice after church services a few weeks before each performance. Our Pentecost Singers are a subgroup of older singers, mostly middle-schoolers, who sing on their own for special occasions. If you’d like to join us, please contact Diane Beckwith: dianebeckwith22@gmail.com. Our Youth Band plays on Christmas Eve and Celebration Sunday, rehearsing a week before. We invite all who play strings, woodwinds, brass and percussion to join the band. Bill arranges parts for all instruments. Our Senior Choir offers two Music Sundays each year in May and December, singing great works by Mozart, Handel, Bach, Schubert, and modern composers like John Rutter. We bring in some of our town’s best players to work with us. Ithaca Brass, the faculty quintet from Ithaca College, join us for a Sunday before Christmas to play music during our service, and a to lead carol-sing for everyone afterward. 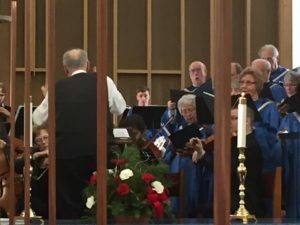 On Easter, trumpets and timpani play for Handel’s “Hallelujah,” with all congregation members invited to come up and sing along. 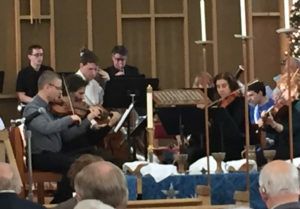 Musicians join at other special times, such as our Epiphany Kings’ pageant every two years. We are always looking for ways to enrich our musical life.